On Tuesday, June 26, 1979, one hundred years to the day after the formation of the Winchester D.G., a service of Thanksgiving and Dedication was held in the quire of Winchester Cathedral, about 350 members, guests and visitors attending. The organising committee had no knowledge of how many would be present at such a service and must be feeling pleased that such numbers came. The service (at 7.30 p.m.) also took its place amongst a series of events in Winchester to commemorate the 900th anniversary of the building of the present Cathedral. The 12 bells were rung before the service by the Cathedral band under John Colliss (vice-captain), Stedman Cinques being conducted by David Forder. At the same time, in the Cathedral, the tower captain (Graham Grant) who is also deputy organist, was rehearsing a group of ringers who had come from various parts of the Guild’s area to form a choir. The theme of the service was reflection, thanksgiving and dedication; the Dean of Winchester (V.Rev. M. S. Stancliffe) who is Patron of the Guild, offered the Guild the opportunity to devise the Service and this was constructed by the Master (Kenneth S. B. Croft) and his son (William) who is an ordinand at Cuddesdon. Canon Anthony Caesar (Precentor and Sacrist) gave considerable help in the arrangements. Following the entry of the Mayor and Mayoress of Winchester (Cllr. and Mrs. J. D. Green), the choir, clergy and Bishops of Basingstoke (Rt. Rev. Michael Manktelow) and of Winchester (Rt. Rev. John Taylor) the opening hymn: “O worship the Lord in the beauty of holiness” was sung. The bidding particularly mentioned the two founders: Arthur du Boulay Hill and Thomas Madge (priests) and there were prayers followed by a reading: Reflection and Thanksgiving (from I Chronicles) by the Ven. Ronald Scruby (Archdeacon of Portsmouth) and after another hymn a further reading from Ephesians, read by Mrs. Gilian Davis (Christchurch Priory). 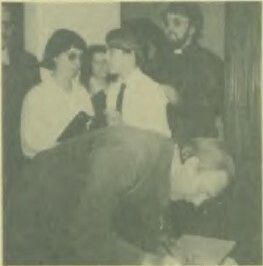 Sign here: The Bishop of Winchester (Rt. Rev John Taylor) signing the special commemoration book whilst other ringers and visitors await their turn. The Prayer of Thanksgiving was led by Mrs. Betty Robbins, Ringing Master, Basingstoke District, where the Guild was founded. The hymn before the address was “Angel Voices ever Singing” and after the address given by the Dean of Winchester. “Christ is made the Sure Foundation”. The Guild Master then offered the Dedication, each of the parts he said receiving a response from the members, and a final prayer was followed by a course of Grandsire Triples on handbells. A retiring collection was taken during the singing of the hymn “All my hope on God is founded” and the Bishop of Winchester then pronounced the Benediction. In the Wykeham Suite of the Wessex Hotel, near the Cathedral, the company then retired to partake of sherry and other refreshment and to meet their Civic and Religious guests as well as to enjoy the company of other friends from near and far. A record book for all attending to sign was in the foyer and a special bar was well patronised. It was a highly successful evening and one which will be remembered for many a year. The official representative of Winchester College was David Threlfall, a name not unknown to the ringing fraternity. The four who rang the handbells in the Cathedral were Barry Fry 1-2, Betty Robbins 3-4, William S. Croft 5-6, Graham Nabb 7-8. The clergy procession, in addition to the Cathedral dignitaries, included the Bishop of Basingstoke; Canons K. W. H. Felstead (Master of St. Cross), K. H. Gibbons (Vicar of Portsea) and R. J. Milner (Rector of Southampton); and the Revs. Roger Keeley (Master, Salisbury D.G. ), W. T. Godfrey, N. De Keyser (Yateley) and B. H. Trevor-Morgan (Christchurch). Three Guild Masters: Michael Church (Guildford). Rev. 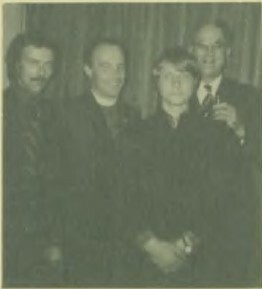 Roger Keeley (Salisbury) and Ken Croft (Winchester and Portsmouth) with (in the front) the representative of Winchester College (David Threlfall). The Stewards, under the direction of Derek Jackson (Christchurch & Southampton District) represented each district viz: David Hughes (Alton & Petersfield); Philip Murduck (Andover): Jeffrey Hill (Basingstoke); Frederick Green (Isle of Wight); Charlotte Olding (Portsmouth) and Prisca Tremeer (Winchester). The Collection, after the expenses of the service had been met, was donated to the Cathedral by the Guild.